Today, I am overwhelmed with gratitude for who my children are and who they are on the path to becoming. You see, sometimes as a parent, it is easy to get bogged down in the day-to-day tasks and responsibilities of parenting. Pack the lunch. Do the laundry. Give out chores. Make sure chores are completed. Read this. Sign that. Pick up here and drop off there. Get them clean. Tuck them in. Wake them up. Love them. Challenge them. Rinse and repeat. Somedays, the tasks of parenting are overwhelming. Like the days of having several littles all at once. Or the days of having several school age all at once. Or the days of too many places to be and not enough time to get there. Or the days of homework/sports/holidays that seem to collide at the same time. Or the days of… well, you get the picture. Somedays, the challenges of parenting are overwhelming. Like the days when the stomach bug hits everyone at the same time. Or the days when a full moon turns angels into demons. Or the days when no matter what you cook, people turn up their nose. Or the days when the money has run out and the bills run in. Or the days when something is wrong with your baby and no one can figure out what. Or the days when… Well, you get the picture. But some days, as a mom, I am overwhelmed with gratitude. Like the days when all heck broke loose, but the kids are now sleeping in their beds and I realize how grateful I am for beds for them to sleep in. Or the days when it’s so noisy I can’t hear myself think and I then I realize how grateful I am for children who are healthy enough to make all that noise. Or the days when the money has all run out because there was just enough to pay all the bills and fill the fridge. Like the days when I see each child for the incredible ways s/he is growing in grace. Lately, God has been doing a great work on my parenting. God (through the words in a couple of books) has been challenging me to see the unique goodness in my children and to give thanks in all circumstances. And as I ran the busy after-school hours in our home today, I am overwhelmed with gratitude for my children and this journey we are on together. So go, find what is good and lovely and true in your kids. Make a list. Give thanks. And in the hard moments, in the hard days, in the dark of the night, remember that list. Remember that you are called to this journey of parenting and God equips those who are called. There are times in the motherhood journey when you just shake your head, knowing that you’ve done right and wrong and nothing all at the same time. Yesterday was one of those days. It was in the morning. Climber and I were trying to get ready to head out to run some errands and a battle of the wills began. Now before you ask, yes, I’ve read Dr. Dobson’s Strong-Willed Child (and perhaps I should read the updated version). And yes, I know that doing battle with a 4-year-old is not ideal. But it happens. So there we were, waging war against an unseen foe and each of us was going to win. How do I know? Climber comes by it honest. I was a strong-willed-child myself once. I’m still pretty strong-willed. There is value in that. There is tenacity in that. There is determination in that. There is achievement in that. And there is great disaster in it as well. So there we were, two strong-willed children together, doing battle and neither of us was backing down. But you sang a song in church about listening to your kids, so you need to listen to me! I told you he is going to be a lawyer one day! Or a hostage negotiator. Not sure which. Anyhoo… My strong-willed-self immediately responded with “I remember singing no such song!” I’m the pastor. I picked out the hymns. I announced the hymns. I should remember right? In that moment, I shook my head, knowing that I’ve done right and wrong and nothing all at the same time. I’ve done right in that Climber was in church and listening. He knows how to apply some of what he’s learning about God’s love for us and others in the real world (even if it’s a little off). I know that Racer and I have something to do with that. I’ve done wrong in that I have probably modeled that strong-willed argumentative personality too much. I’ve worked on it and need to keep working on it. And yet, even as I’ve done right and wrong, in many ways, I’ve done nothing at all. Climber is who he is. As a mother, I have great influence over my children’s personality. Yet, they are who they are. God is designing them despite of my actions. And they have great care-takers that have influence. And great teachers. And great faith communities. Sometimes, as a mother, I do nothing and my children still turn out great. So mommas, don’t worry. You are doing a lot of things right. And sometimes you just have to shake your head, knowing that you’ve done right and wrong and nothing all at the same time. And your kids will be okay. Tonight I was frustrated. I didn’t feel well and I was short with my children. I put them to bed and let them pray on their own. Later, both the young boys came out to go to the bathroom again. This was the conversation with one of them. Yep. Sometimes God gives us just what we need to remind us that we’re doing something right. Today marks the 52nd anniversary of the bombing of the 16th Street Baptist Church where 4 young black ladies were killed as they were getting ready for Sunday morning worship. This past spring, my family had the opportunity to visit Birmingham, AL. We saw the church (we were not able to go inside), visited the Civil Rights Institute, and walk through the park where the Children’s Crusade began. It was an eye-opening and humbling and amazing visit. I have a hard time imagining what this day must have been like. As we stood before the church, I tried to image my children in the basement of our church, getting ready for a time of worship. I tried to imagine the sound of the bomb. I tried to imagine the smell and the fear and the chaos and the emotion. I began to weep. And as our family learned more about that day (and the Birmingham Civil Rights Movement in general), Professor was particularly engaged. We learned that in the city’s chaos after the bombing, 2 black boys were also killed. One of them was Virgil Ware who was 13 years-old and was shot and killed by 16 year-old Larry Sims. This killing was particularly shocking to Professor. As we read about the murder of a young man his same age, Professor turned to me and said “But mom, his killer was an Eagle Scout. Scouts aren’t supposed to act like that Mom. Why did he do that?” Tears welled up in my eyes (and are again as I type). That’s a good question. Why? We human beings are complicated creatures. Created in the image of God, sin entered the world and it hasn’t left. Too often, humanity has continued to place what we want above what God wants. We pass those selfish desires on to those around us, to our children, to the people we are charged to care for. And too often we pass along that “I” am created in the image of God and forget to pass along that others are also created in the image of God. And too often we forget that together, WE are created in the image of God. I still can’t imagine what that day was like. I still can’t imagine what the bombers were thinking and feeling. I still can’t imagine what the 16th Street Baptist Church family and friends were thinking and feeling. I still can’t imagine what the mothers and fathers were thinking and feeling. And maybe I don’t really want to because it might hurt too much if I do. And maybe that keeps me disconnected from the fullness of the image of God. This weekend, my family had the rare opportunity to take a little vacay at the beach (and the racetrack of course)! I, of course, wanted to get just the right memory shots so that years from now we’ll look back upon the Facebook album (because of the new memories feature of course) and fondly recall the great time we had playing in the sand and seeing cool things at the track. So, the kids began to play in the sand and water and began to take some pictures. Digging in the sand. Looking for shells. Buried in the sand. Cool writing in the sand. What? Did those words just come out of my mouth? I can’t get in the ocean and play with my kids because I’m taking pictures of them playing so we can remember how much fun we had? You know what? I don’t regret it a moment. You see, instead of documenting the fun, I was a part of the fun. I took off my swim cover-up, got in the ocean and played with my kids. We went out deep. We fought waves (sometimes with punches and sometimes with kicks). We chased each other on the beach. We body surfed (well, our version of it anyway). We laughed. We made memories together. I think that’s worth remembering. Even though I’ve been parenting for over 13 years, I still have lots to learn. During those 13 years, I’ve read many books and articles on parenting, some were good, some were really good and some I didn’t finish. I just finished, by far the best parenting book I have ever read. What I loved about this book was that it didn’t give a list of “do this” or “don’t do that” kind of advice. It spoke more broadly about life concepts and principles that are important in the Amish way of life that have led to children feeling secure and loved, yet a small part of something bigger than themselves. I may not be Amish, but so much of their life philosophy is what I hope to be. The importance of family, community, discipline, work ethic, healthy use of technology and of course faith are vital to raising children who “grow up to be people of value” (p. 156). The point is not so much that children are happy, but that they grow up to be adults with integrity and who place their own needs in perspective with the needs of the family and the community. Happiness is an emotion that can come and go based on circumstance. The values of family, community, discipline, work ethic and faith are values that last a lifetime, bond people together and create a life in which children know what to expect, know they are loved and know they have value to the greater good. Together, Serena Miller and Paul Stutzman weave stories of Amish parenting and Amish life together with experiences of “Englisch” living. 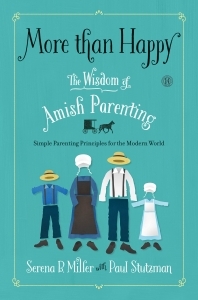 In showing how the “to dos” of parenting may look different in various family contexts, they show how the overarching principles that guide the Amish way of life can also guide other families. How they can guide my family. While I was reading, I didn’t feel bad about my failures in mothering, only inspired to be more than we already are. I was encouraged to be more intentional about how I teach my children by modeling life. I thought about my own ways of mothering and how I can shift some of the functioning of our family to create a home where the children have important roles in our home, where we play more together and where we are more open and intentional about some of the “whys” of how we do things. We’re headed in the right direction. Many families are and most want to be. I think the key is that we must all be more intentional about speaking and modeling and teaching the values that we want to instill in our children. And as the Amish term gelassenheit teaches us “We are not alone in this. God has a plan and He is in control” (p. 323). Sharing is hard. We teach kids from an early age to share, but it’s hard work. Even as we grow and mature, we have a hard time sharing our resources. We do it, but we really have a hard time sharing those things that are most special with us. Think about it. What is your most valuable possession? Would you loan it to someone else? Maybe that’s an easy yes for you; if so, you have matured beyond me. My guess is that you would say that it depends on who you’re loaning it to. I don’t just mean with neighbors or teachers or friends. You know, the village you choose to collaborate with in the rearing of your children. I mean parenting. Share the title mom with someone who you didn’t get to choose. With the exception of my first year of mothering, I’ve shared motherhood with other women. I’ve shared the title mom. I won’t lie, it was really hard at first. I didn’t choose her. I didn’t really know her and I sure as heck didn’t want my baby calling her mom. Later, when I became mom to someone who had been mothered by many before, I didn’t like that I had to redefine what a mom was (in a healthier way). I didn’t like that someone else had tainted a title that is special to me, is part of the core of who I am. Here’s the thing. I’m not the best mom in the world. I certainly have things I’m good at, but there are many areas that I’m not good at, don’t know about and just plain aren’t on my radar. I can’t be everything for my children. And I don’t want to be. Sharing motherhood has been challenging, yet there has been a great beauty in the midst of it. One of my children has two amazing moms who love differently, teach different things and give different experiences. One of my children has called several women mom and each one of us has helped mold her into the young woman she is today. In it all, I’ve learned more about who I am as a woman and mother because of these other women. I’ve learned some good things and some areas of needed improvement. I’ve matured and loved and found grace in places that I didn’t want to see it, experience it or give it. Sharing motherhood wasn’t what I expected in my life. Sharing motherhood wasn’t what I asked for in life. Sharing motherhood has been an unexpected blessing in my life. Sharing motherhood has taught me about myself and womanhood. Sharing motherhood has made me a better mom. Now, it’s hard to imagine motherhood any other way.